NEW YORK (CNS) — The phrase “a city on the move” is usually just an expression. Not so in “Mortal Engines” (Universal), director Christian Rivers’ screen version of Philip Reeve’s novel for young adults. In this adventure’s dystopian far future, huge mobile cities roam around battling one another for scarce resources. It’s a bit of spectacle Rivers pulls off nicely. But once the wow factor has worn off, it becomes apparent that the emphasis on special effects has marginalized the human element in the movie. Throw in some flat dialogue from screenwriters Fran Walsh, Philippa Boyens and Peter Jackson and the whole project winds up registering as visually impressive but dramatically sterile. The odd-couple love story at the center of the plot involves Tom Natsworthy (Robert Sheehan), a contented citizen of the film’s locomotive London where he works in the equivalent of the British Museum and rebel warrior Hester Shaw (Hera Hilmar). After attempting to kill one of the British metropolis’ leading citizens, archaeologist Thaddeus Valentine (Hugo Weaving) — in vengeance, she claims, for Valentine’s long-ago murder of her mother — Hester makes her escape. Only moments later, Valentine decides Tom has heard too much of Hester’s story and secretly tries to liquidate him. Though Tom survives, he falls off London in the process, and he and Hester find themselves fighting for their lives in the wilderness. They eventually put aside their differences and join forces to fight Valentine’s attempt to gain dominance for London by reviving the doomsday armaments that long ago destroyed all civilization. They’re aided in the later stages of their struggle by Anna Fang (Jihae), a glamorous outlaw. But they’re also stalked doggedly by Shrike (Stephen Lang), an unstoppable human-android amalgam Valentine unleashes to pursue them. Despite the appealing leads and the innovative gesture of featuring a heroine whose face is disfigured by scars — Hester was wounded in Valentine’s attack on her mother — the picture, though lavish, comes across as wanting. Christian viewers, moreover, may feel somewhat uneasy about the fact that Valentine’s lab is housed in St. Paul’s Cathedral, though the dialogue indicates that this is meant to be seen as an incongruous setting for his evil activities. 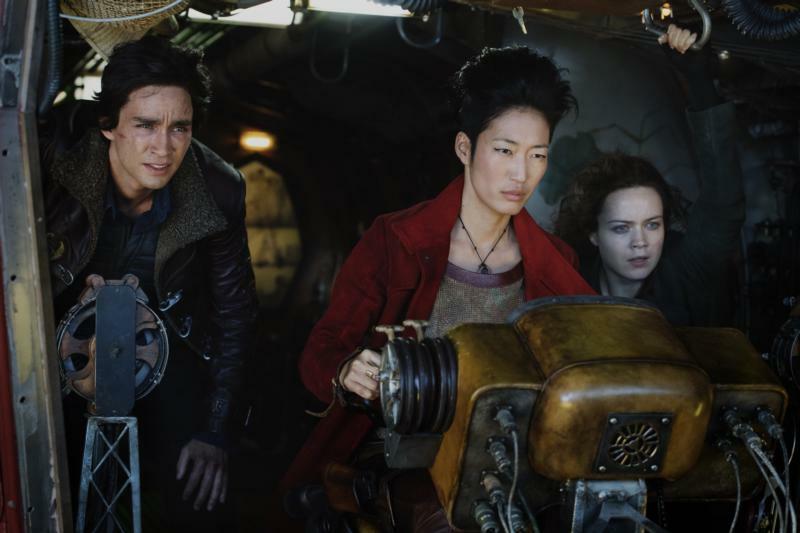 As a cautionary tale about the dangers of advanced weaponry with relatively few objectionable elements, “Mortal Engines” is probably acceptable for older teens. The film contains much combat and other violence with some gore, a mild oath, a few scatological jokes and at least one crass term. The Catholic News Service classification is A-III — adults. The Motion Picture Association of America rating is PG-13 — parents strongly cautioned. Some material may be inappropriate for children under 13.